Part of our job as a material handling equipment company is to provide you with resources to help prevent worker injury, reduce forklift collisions and damage, and help you stay under OSHA's penalty radar. Cisco-Eagle does that by searching out the best safety products on the market and making them available to you. 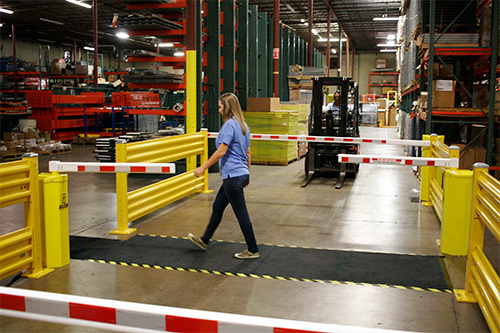 From sensor systems to traffic management, mirrors to guard rail, we are your first place to look for safety equipment. Our specialized Safety Team can do an on-site safety audit and then recommend wise solutions from signage to automated traffic gates. They often improve your operations as well as your safety record. Call us today for assistance.